What are the best optics for the AR 10? The answer can get as varying as the uses of the AR-10. Being the AR-10 the big brother, in a sense, to the AR-15, you cannot go out and just throw on any scope of the discount shelf and slap it on. You will be disappointed with the results. This is a problem as there are so many choices out there for AR 10 optics that it is hard to make an educated decision on what is best for you and what is the best optic for AR10. This is, for many, a crucial decision. When you are out hunting, at the range, or in a home defense situation, your optics need to work right every time. From our experience and analysis, we've concluded that the overall most reliable and effective scope is the Vortex Diamondback 4-12x40. We'll tell you in detail why just below. We'll also take a look at the pros and cons of some of the better-priced choices of Optics for the AR-10. When you are talking about long range AR optics, the ﻿Vortex Diamondback 4-12x40 Riflescope is one that will definitely put meat in the freezer. The argon filled scope makes this an excellent set for hunting as it eliminates internal fogging and protects its insides from moisture. What this means is that you have a longer lasting scope that is waterproof and fog proof. Made out of high-grade aircraft aluminum, which reduces its weight down to 0.91lbs (just under a pound,) means it isn't adding much additional weight for a long day in the field. This optic for the AR will give you a field of view as much as 11.3' at 100 yards, meaning that you not only should be able to see the exact spot your aim for but hit it. This means that that elk at 500 yards on that once in a lifetime hunt should be yours. There is a con about this scope; the eye relief seems a little funny at 12, so you have to bench it or get a bipod if you are going to try to shoot out to maximum range. But most don't do that very often, if ever, and the price point on this is what makes this one of the best optics for AR 10. The Bushnell Trophy TRS-25 3 MOA Red Dot Reticle Riflescope is a short range optic for the AR-10 that should solve those brush gun situations. This scope will not add much weight at all, which is a significant help in a day-long trudge through heavy brush or marshes since it only weighs in at 6 oz. making this an excellent choice for whitetail. There are 11 brightness settings to ensure that the battery will last all day, and it will power down when the hood is attached. This means the Dot is going to be there when it counts, allowing you to see in low light conditions. 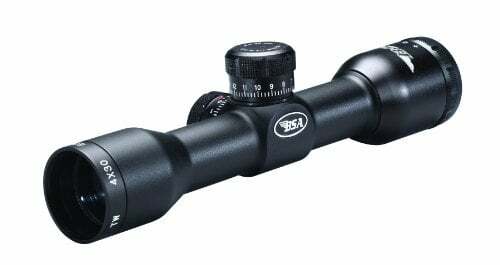 There are no worries about toughness with this scope since it is waterproof, shockproof, and fog proof, making this a great short range, low weight, heavy cover scope. The one con, which isn't a huge deal, is the rubber bikini cover that could break in cold weather. This is a tiny thing, admittedly, for AR 10 optics, and its price overcomes this drawback easily. Get more info on the Bushnell Trophy... Click here. The BSA Tactical Weapon 4 x 30mm Rifle Scope with Mil-Dot Reticle was made for the AR-10. It's designed to take a beating and still put your rounds on target. It is a tough optic, made for tactical situations or hunting. 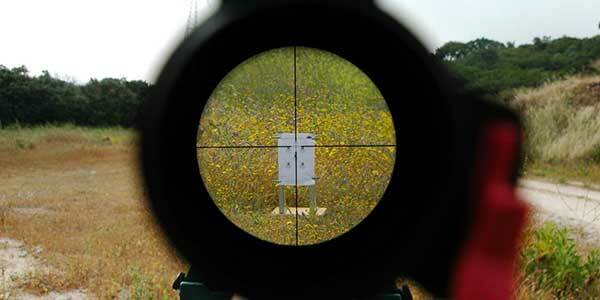 This scope will easily zero at 100 yards, which is great for most whitetail hunting. Although, this is not a long range scope, it is a good in-between from the brush and short range scopes and the really long range scopes, which makes of this an excellent optic for AR 10. See reviews on the BSA Tactical Weapon... Click here. The Bushnell AR Optics FFP Illuminated BTR-1 BDC Reticle is one of the best AR scopes for the money you can get. Not only is it tough, having all the essential features, such as waterproof, fog proof, and shockproof; it is also said that it is very hard to scratch. The FFP (First Focal Plane reticle) holds the line with BDC (Bullet Drop Compensator), so when you are flipping back and forth you are still on target; this is nice when out hunting and the distances to targets keeps changing. But, this scope's real claim is clarity. This really comes in to play in low light conditions with an illuminated reticle so that you will be able to hit your targets in low light at varying ranges. The Bushnell is a great scope for coyotes to pronghorn or those afternoons after prairie dogs. You will have to check for the proper size scope rings for this scope, but this is a small inconvenience for one of the best optics for AR-10. 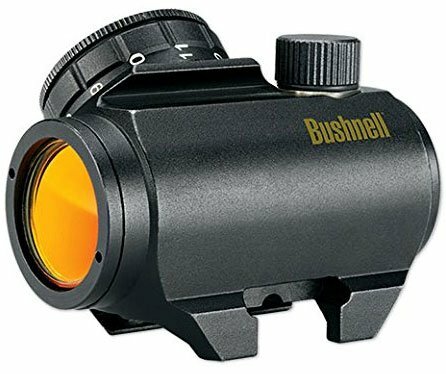 This scope, manufactured by the prestigious Bushnell, makes sure that you can not only see the target, but you hit it as well. See reviews on the Bushnell Illuminated... Click here. As you could see on these AR 10 optics reviews, with such varying choices out there for the AR-10, you will need to look closely at your o​​​​​wn personal applications and use. For home defense, you're going to need short range and a quick and parallax free design. If you're going out to the range, and shooting long distances, the sight for home defense would not be the best choice. For hunting, you will need a more rugged scope that can easily handle varying ranges and changing light conditions; you will need the proper optics so they don't fail you when that once in a lifetime shot comes to be.